Home » About » Blog » Is It Time to Get a Colonoscopy? Find Out. Nobody really looks forward to getting a colonoscopy. But, keeping up with routine colonoscopies is an essential part of a person’s overall health because the procedure is commonly performed as a “first-tier” screening test for colorectal cancer. According to the American Cancer Society (ACS), the average lifetime risk of developing colorectal cancer is about 1 in 22 for men and 1 in 24 for women. The good news is: “Regular screening continues to be the best defense against colorectal cancer. It can detect pre-cancerous growths as well as cancer, which is highly treatable if caught early,” said David Weinberg, MD, chair of medicine and chief of the gastroenterology section at Fox Chase Cancer Center. 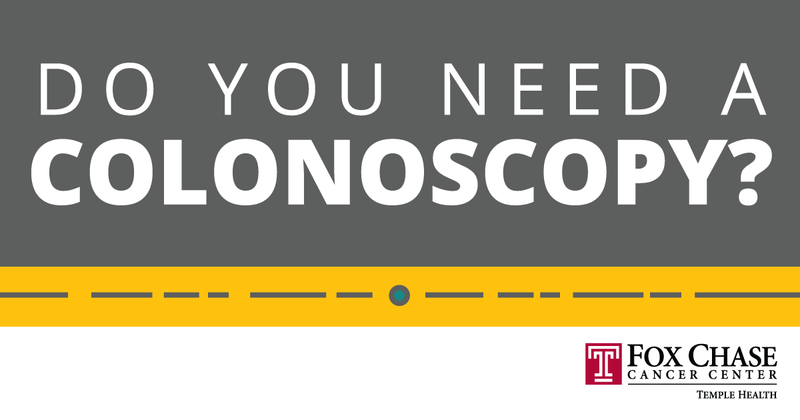 This flowchart can help you determine if it is time to get a colonoscopy. Learn more about the risk factors and symptoms of colon cancer.